This post contains affiliate links. See Amazon widget at the end of the post for links to books mentioned. Today I'm calling my posts for "U" and "V" unfinished, verily, and moving on to "W." I honestly had no idea what to do for those letters, anyway, and I have company coming this weekend so I need to get a move on here! I love Laura Ingalls Wilder's books. I read all of her "Little House" books growing up, and she was the first author who ever felt like a friend to me. A couple years back, when I was on the Schoolhouse Review Crew, I got to review a biographical DVD of her life, and it was so much fun! I learned a lot of things I hadn't known before, and I loved getting to know more about her life. Laura Ingalls was born in Wisconsin in 1867. She was the second of five children. She and her family were "settlers," and they moved often. The books tell of her experiences growing up as they moved throughout the Midwest. 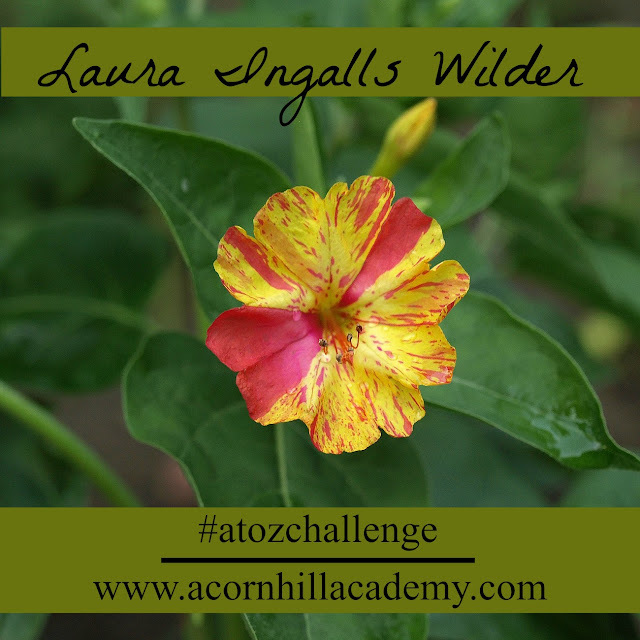 Laura became a teacher at the age of 15, and taught in a one room schoolhouse. I am trying to picture my 15 year old living away from home and being responsible for a classroom. I'm not having much luck with that, actually. Life was so different then! I felt like I grew up with Laura through her books. Actually, that was intentional on her part. One of the things I learned in the DVD was that her daughter, Rose, helped her write the books, and Rose wanted her to switch the main character to her younger sister, Carrie, to keep the heroine a young girl. Laura refused, because she felt readers were growing up with her in the stories. I have tried to imagine some of the books with Carrie as the main character, and I just can't. I still cry when I read about Jack in Little House, even though I've read the books many times and I *know* what happens... sigh. I do love these stories. They're also excellent living books for the Westward Expansion. In the last few years, there have been several books published that give additional insight into Laura's life. My mom gave me a beautiful, hardcover biography for Christmas a couple of years back, called Pioneer Girl. It's a beautiful book, and it's HUGE. And heavy. It's not one you're going to tuck into your purse, that's for sure. There is also a picture book called Pioneer Girl: The Story of Laura Ingalls Wilder, which I found either at a thrift store or a library sale, and I'm so excited to have that in my library! I have visions of little girls (or boys, but probably girls) coming in, wanting to know more about Laura, and now I have something to show them! Also, when my girls were little, I discovered some Little House picture books, like Sugar Snow. They loved them! The illustrations are done by Doris Ettinger, rather than Garth Williams (who drew the illustrations most of us remember in the books), and she did a beautiful job of creating illustrations that are reminiscent of Williams'. I am not really an advocate of reading picture books when you can just read the full stories, but these were such fun for my girls–they loved looking at the pictures, and they could read them for themselves, at an age when the chapter books would have been overwhelming to them on their own. I think most boys enjoy Farmer Boy, the book Laura wrote about her husband, Almanzo's childhood. It was very different from hers! Naturally, there are some really excellent homeschool resources based on these book. The Prairie Primer, from Cadron Creek, looks like all kinds of fun. I didn't use it with my girls, but I kind of wish I had. They weren't into it as much as I was, though. Heh. There is even a Little House Cookbook. As I was looking for the books I've included today, I realized I have a couple more about Laura that I had forgotten about. Guess I'd better get reading! I'm out blog hopping from North Carolina on the W day of the alphabet. Love what I have found here. This blog gets my blue ribbon for presentation. Easy to read and navigate. Not all cluttered up. The information, presented with clarity is the whole point. Congratulations. While you've been seeing things anew, I have been writing about hotels and inns, the architecture and architects, the settings for these significant places in a community. Today was tea at the Washington Duke Inn. Not too late to join me. Stepheny, thank you! What a lovely compliment. I enjoyed reading about the Washington Duke Inn, for sure! I lived in Apex for 13 years. I'm really looking forward to hearing more about the Houghtlin garden!